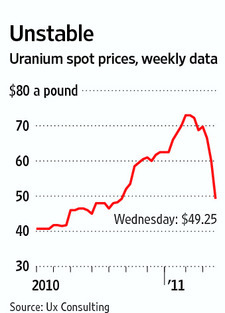 Trading in uranium on the spot market totalled about $2.5 billion in 2010. The Fukushima nuclear plant disaster is probably temporarily changing that picture as hedge funds and banks unload their uranium portfolios. Explosions and radiation leaks in Japan have worried some traders too, who are dumping their uranium holdings amid fears that the Japanese crisis could stall expansion of the world's nuclear programs. Almost three million pounds of uranium have changed hands in the spot market this week, five times more than the average volume. The result is that after an 80% run-up over the past eight months, uranium prices have tumbled. They reached a three-year high of $73 a pound in February, but dropped $13 earlier this week and fell to $49.25 on Wednesday, according to Ux Consulting Company. Most of the uranium traded in the physical market is in the form of uranium oxide concentrate, which is several steps away from being used as nuclear fuel. After utilities buy uranium on the spot market, these facilities convert the oxide into a gas form of pure uranium, called uranium hexafluoride. The gas, which is radioactive, is then enriched to become nuclear fuel. It is then transported to fabrication centers to convert into a pellet, which is put into a fuel rod that goes into a nuclear reactor.